Print labels directly from iOS and Android devices with this portable office label maker that can also be shared with multiple users. Introduce your office to a new way of creating labels with the LW-600P – smallest and lightest 24mm desktop label printer on the market1 – by printing from your computer, or directly from your iOS or Android device, connecting via Bluetooth2 so multiple users can share it. With one nine-metre tape, fast print speeds and a high resolution, print quality labels quickly, almost anywhere. It comes with a handy AC adapter or can be used with six AA batteries, so you'll always have power when you need it. Choose from pastel yellow or red with black text for a coloured label that’s a little more subtle. Available in a range of widths, from 6mm to 36mm. This great-value white label tape is perfect for everyday use. It’s available in a wide range of widths, from 6mm to 36mm, with a choice of red, blue or black text. Perfect for more discreet labelling, this transparent tape comes in a choice of widths, from 6mm to 36mm. Choose from white or black text. These labels are backed with extra-strength adhesive for a secure hold and long-lasting sticking power. Available in yellow, white and transparent with black text, in 9mm, 12mm and 18mm widths. 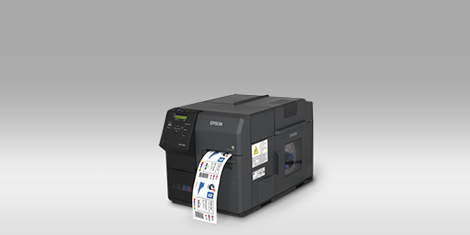 For maximum label life, use in conjunction with the Epson LabelWorks LW-900P’s edge-rounding function that helps prevent label corners peeling. The labels’ black background looks discreet when used on black surfaces, while the white text is easy to read. Available in black with white text, in 12mm and 18mm width. 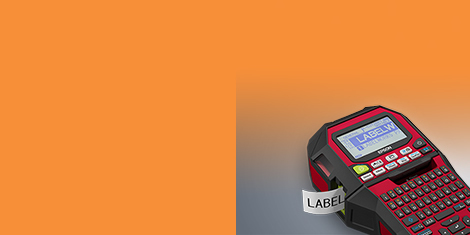 The brightest label tape in the range – ideal for high-visibility labelling that demands attention. Available in fluorescent yellow or green with black text, in 12mm and 18mm widths. This matte silver tape with black text is ideal for printing barcodes onto, as its matte silver surface is easily scanned. It’s also ideal when a more modern look and feel is needed. Available in 12mm, 18mm and 24mm widths. Offering luxury, premium-look labelling, these metallic tapes come in glossy silver or gold with black text in 12mm width. This 12mm-wide paper label tape has a matte white surface which is easy to write on. It can also be printed with black text. Available in 12mm width. Create durable, long-lasting name tags for work clothing. Ideal for maintenance, healthcare and catering industries, simply print out your own label and iron directly onto clothes – no need for a separate piece of fabric or protective covering. Able to withstand extremely high temperatures of up to 225 degrees Celsius, this safety tape is ideal for factories, warehouses and other hazardous environments. You can easily asset-tag a wide variety of items, safe in the knowledge that these long-lasting labels will stay attached. This safety tape is ideal for labelling equipment and areas, such as stairs and emergency exits, as it glows in the dark for up to eight hours. Durable and long-lasting, anything tagged with these tapes will be easy to see - even long after after the lights have been switched off. Ideal for low light levels or environments with poor visibility, this safety tape ensures that important items and materials can still be seen. Thanks to their durable, long-lasting coating, reflective labels can be used both indoors and outdoors. Designed to wrap around and adhere to cables for secure, easy-to-read cable labelling. Available in white with black text in 24mm and 36mm widths. For best results, Epson Magnetic Tapes should be printed at room temperatures of between 15°C and 35°C. For best results, Epson Satin Ribbon Tapes should be printed at room temperatures of between 15°C and 35°C. 1 Smallest and lightest 24mm desktop label printer on the market compared to leading thermal transfer desktop label printers that print up to 24mm in width, available on the market in Europe as of June 2013. 3 Download the Epson iLabel app from the Apple App Store and Google Play.